Visit two of the most picture perfect locations in North Wales in one day….for under £20! We arrive first in Portmadog, which offers a bit more hustle and bustle than Criccieth. The harbour is a thing of real charm and beauty. In times gone by, it was a vital, busy shipping port for the international slate trade, brought down from Blaenau Ffestiniog. The maritime history depicts its proud past. Be sure to take a walk around the harbour and soak up the history. A major feature of Portmadog are the steam trains of the Ffestiniog and Welsh Highland Railways – the oldest rail company in the world. You can cross the street and go straight into the historic rail station. The steam trains still operate today so you’ll see one in its full operational glory. Lunch will be enjoyed in Portmadog, with some excellent places to choose from. Then hop back on board our coach for a 5 mile journey to Criccieth – enjoy the peacefulness of the seaside resort, overlooking Tremadog Bay. 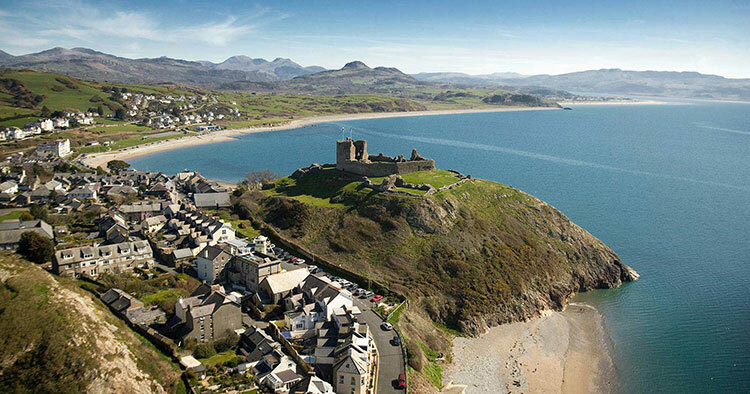 Criccieth is dominated by the beautiful Criccieth Castle, standing proud at the top of the hill with extensive views over the town and surrounding countryside. Enjoy traditional Welsh hospitality and charm in the local café’s and public houses. You can then sit back and relax, and enjoy the coast views as we take you home. ALL bookings should be made through Burland Coaches on 01270 303 150. Don't forget to check out our other excursions. All excursions arrive back in Crewe and Nantwich around early evening 18.00 / 18.30 – we may run a little later if the traffic is bad on any motorway e.g back from Spalding or similar. Burland Coaches work closely with our valued customers Pallgo, Crewe & Nantwich Ramblers, Crewe Alexandra Supporters and many more. We value you all. Burland continue to run their own excursions as well and there will be exciting developments so please keep in touch. Any queries please phone Judith on 01270 524403 or send us an email. You can be assured of a professional, polite and personal service.